The rise of Afghanistan's cricketing fortunes continues unabated. Four months after they qualified for ODI status in South Africa, they have won their maiden first-class match as an international country by stunning Netherlands, a side far more experienced, with an extremely tense one-wicket win in Amstelveen. The rain-affected match was so dominated by the ball that it was some surprise the match lasted as long as it did. But not even Edgar Schiferli's five-wicket haul was enough to prevent a gripping, successful run-chase by Afghanistan. Afghanistan are a country still at war, and are continually reliant on benevolence by charities and organisations such as MCC, who have helped provide equipment, training and pitches to schools in rural communities. They remain highly inexperienced, raw and rusty. But as their barnstorming performance in the World Cup Qualifiers earlier this year suggested, they are never to be underestimated. The day commenced with Afghanistan requiring 168 runs to win, with eight wickets to spare, on a pitch that had troubled all the batsmen, but Noor Ali and Nowroz Mangal set about the task well. They added 23 to the over-night total, before Mangal (19) was caught by Wesley Barresi while having a go at a wide delivery from Mark Jonkman. The wicket brought Asghar Stanikzai to the crease, who began to build another sturdy partnership with Noor, as Afghanistan began to take control. The pair put on 49 for the fourth wicket, edging within a hundred of the target, before Schiferli - Man-of-the-Series in April's World Cup Qualifiers tournament - managed to find the edge of Ali's bat, caught behind for a well earned 56. Stanikzai soon followed - late onto a delivery from Pieter Seelaar which kept low and shot on to hit the base of his middle stump for 26. Mohammed Nabi didn't make much of an impact either, as he miscued a drive off Peter Borren, providing Schiferli with an easy catch. By lunch, the match was hanging in the balance with Afghanistan needing a further 64 with four wickets remaining, having battled back into contention. With prospects of an exciting afternoon ahead for the crowd in Amstelveen, the visitors restarted by adding a further 18 runs before they lost Raees Ahmadzai, an agriculturally-effective free-swinging batsman, for 26. He edged to Barresi in the slips, who took an outstanding catch to maintain the pressure on Afghanistan. Netherlands tight bowling attack pinned down Mirwais Ashraf and Samiullah Shenwari, making runs very hard to come by, but they stuck in there, scoring in ones and twos. With Afghanistan edging nearer their target, Netherlands found the breakthrough they were after, as Ashraf was finally removed by a diving catch by Mudassar Bukhari off Schiferli for 31. This left Shenwari and Shapoor Zadran with the nerve-wracking task of scoring the remaining ten runs, facing the aggressive bowling of a pumped-up Schiferli. By this stage, even defensive strokes were being cheered by the Afghanistan contingent from the sidelines. And with only six runs required, Zadran (1) failed to offer a shot as Schiferli wrapped him on his back pad to claim his fifth wicket, leaving the match on a knife-edge. 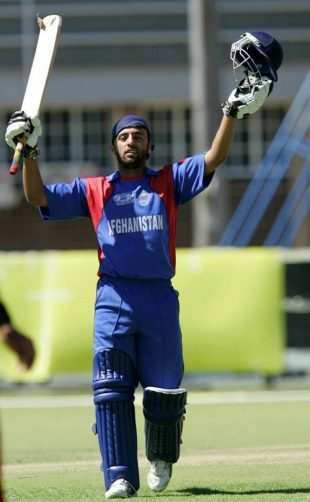 But, in the next over, Shenwari threw his hands at a Bukhari delivery, the ball slashing over the slips for four as Afghanistan snatched an unlikely victory, their first in the Intercontinental Cup, and another significant achievement for a country so new to the international fold.